We have already announced that we will be exhibiting at IBC this September. Now we are announcing a special Netgen Business Day in Amsterdam to take place as a part of the exhibition. The main purpose is to present the first version of our layout and block management solution for eZ Publish, eZ Platform, and Symfony projects in general. Don’t miss the opportunity to see the first demo of a solution you might be using in your projects very soon. Netgen Business Day in Amsterdam will take place at the IBC Exhibition venue on Friday, September 9, 2016. In case you want to come, be sure to secure your free IBC Visitor Pass till 19th of August (after that it will cost you 70 EUR). As we have limited space for our event, please let us know if you are interested in coming to the event as soon as possible via info@netgen.hr. We will not start before 11 AM. Presenting the first version of our layout and block management. 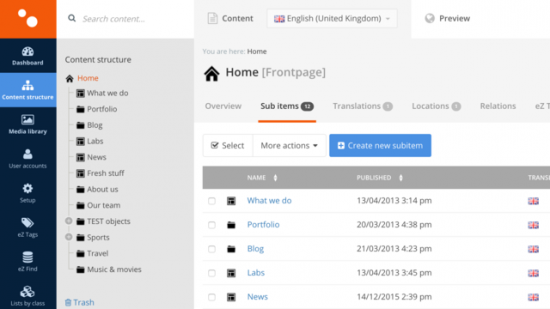 Presenting our improved administration interface for eZ Publish 5. How you could start using the presented solutions. A short update of eZ by eZ Systems (needs to be confirmed). A short update of Sylius by the creator (needs to be confirmed). The program will end by 4 PM. As you can see, it will not be a full-day event so there should be enough time for you to arrive in the morning and return the same day. What is layout and block management? A few months ago in the “full throttle” blog post we mentioned that we are working on a solution for managing layouts and blocks. We haven’t communicated much about it so far because we wanted to build the MVP version first. More information will come soon in a form of blog posts and video clips, but since we wanted to make the premiere more direct for an interested audience, we put together the Amsterdam event. As we are currently seeing a big efficiency gap in how we implement sites in the new eZ stack and Symfony, we decided to make a solution that will significantly improve our implementation and maintenance of websites. The solution is built on top of Symfony and decoupled from eZ so it could be used with other systems, like Sylius. The main idea is to make managing responsive layouts and reusable blocks simple for the UX designers as well as to make it very simple for the developers to extend it. It is not a WYSIWYG tool, it is rather a lo-fi prototype version of the site. Layout types with zone placeholders (extensible as Twig templates). Layout instances with zones for holding blocks or inheriting other zones. Layout resolver that uses conditional connecting of layout instances to targets (routes, ez locations, ez subtrees, URLs, etc.) to decide which layout to use for each request. Block definitions (simple blocks, content blocks, custom blocks, containers, etc.). Block instances placed in zones. Block items (data from backend system(s)) used by block instances. Backend part that implements the model in Symfony. Interface for managing layout instances. Interface for mapping layout instances to targets like routes, ez locations, etc. Interface for managing block instances inside zones. Integration with our improved administration for eZ Publish 5. The envisioned way of working includes web site builder creating layouts in an easy to use interface, by drag and dropping blocks into different layout zones. These layouts are then applied to eZ content nodes or Symfony routes and the result is a crude (but working) prototype of the site created in matter of hours. Customizations (both serverside and frontend) are the next step and, depending on the complexity, the site can be up and running in record time. The best part is that the process of designing and developing a site could be iterated much faster. Actually, the design and development phases would overlap to support a more agile process. Even after the site goes live, the maintenance and small improvements could be done much easier. To learn more, attend our Amsterdam event. 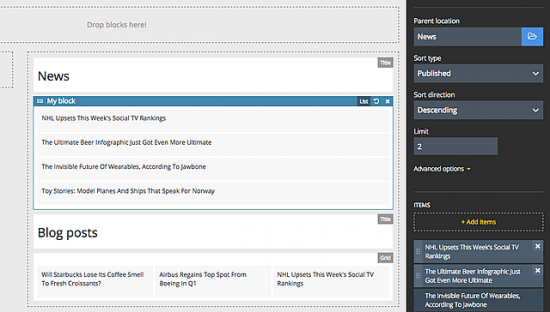 What is Netgen improved Admin UI for eZ Publish 5? When we started to build the layout and block manager, there was no eZ administration ready for working with the new stack and Symfony – eZ Platform UI has not been ready yet. Therefore, we took the old legacy admin and made it hybrid. The pagelayout and main menu are implemented with Twig and the new eZ stack – this was necessary as we wanted to integrate the new Symfony based components inside the same UI. Some markup and CSS were overridden so that the UI gets a modern visual appeal – this was also necessary. The legacy kernel is still needed, making this is a UI suited for eZ Publish 5 projects. We have already been using it for many clients of ours for the last 9 months. To recapitulate: Netgen Business Day in Amsterdam will take place at the IBC Exhibition venue on Friday, September 9, 2016. Secure your free IBC Visitor Pass till 19th of August, there are only a few days left, and let us know if you want to come as soon as possible via info@netgen.hr.